In a late change to the published programme, the Wargrave Local History Society's May meeting was an illustrated presentation about Robert Piggott and the Wargrave Schools, given by Society secretary, Peter Delaney. He began with a brief history of the Piggott family, who had originally come to England with William I at the time of the Norman invasion. There were several branches of Piggotts in Wargrave, but in the family of 'particular interest', William Piggott was a farmer, born in Wargrave in 1682. In due course, he married Martha Turner, of another Wargrave farming family, who lived at Turner's Farm. Only 3 of their children survived beyond childhood - John, born in 1720, Robert, born in 1724 and Ann born in 1735. In 1770, John gave land to the parish for the building of a Parish Workhouse - buildings that were later used for the infant school. Robert was a farmer, and a churchwarden at St Mary's. His first wife, Mary Fisher, died in 1772, and from his second wife, Elinor Brookhurst, he inherited several buildings, including some properties in the City of London. Robert died in August 1798, but had written his will two years earlier, in 1796. Most of this was concerned with the running of the schools. Boys were to be taught "reading, writing, arithmetic and other useful learning", whilst girls were to be taught "reading and sewing plain work". He set out the rules for the management of the school, including the salary of the master and mistress, and payments made to the parents of pupils for their maintenance and clothing. The trustees first met in April 1799, when there are boys who leave having completed their time there, so the school already existed and had probably begun no later than 1794. The schools were housed in cottages in the High Street, which seem to have been part of Turner's Farm, until 1828. In due course, a new school was provided on land given by Lord Braybrooke in 1862, to provide for 100 boys, 100 girls, at a cost of £2,050. As pupil numbers continued to increase, in 1910 the infants moved from School Hill to use the old (recently closed) District school in the workhouse buildings and then in 1963 to a purpose built (present) school in Beverley Gardens. Pupil numbers continued to grow, and by the 1930s the School Hill site was over crowded. 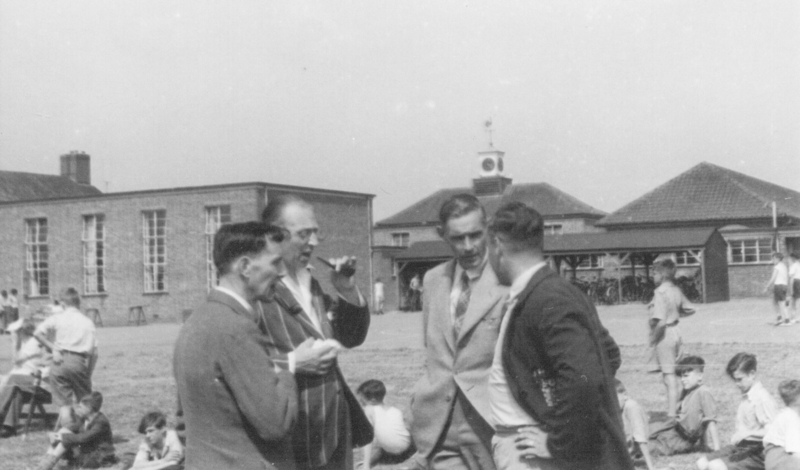 Under the 1936 Education Act, if a community raised a quarter of the cost of a new 'senior' school, the rest of the funding would be provided from public funds, and so the Vicar of the time, Canon Stephen Winter set about the task - with the involvement of several surrounding parishes - Sonning, Hurley, Twyford, Hurst, Waltham St Lawrence, White Waltham. The foundation stone was laid by the Lord Lieutenant of Berkshire, after dedication by the Bishop of Oxford, in October 1939, and the formal opening took place in September 1940. The safety of children coming from south of the A4 was of concern, and the Ministry of Transport asked if the County would prefer a tunnel or a bridge there - in the event, it was well over 30 years before a bridge was provided. Due to the wartime conditions when it opened, buses could not be provided to bring in children from the furthermost so the Education Committee offered their cycle scheme to parents. 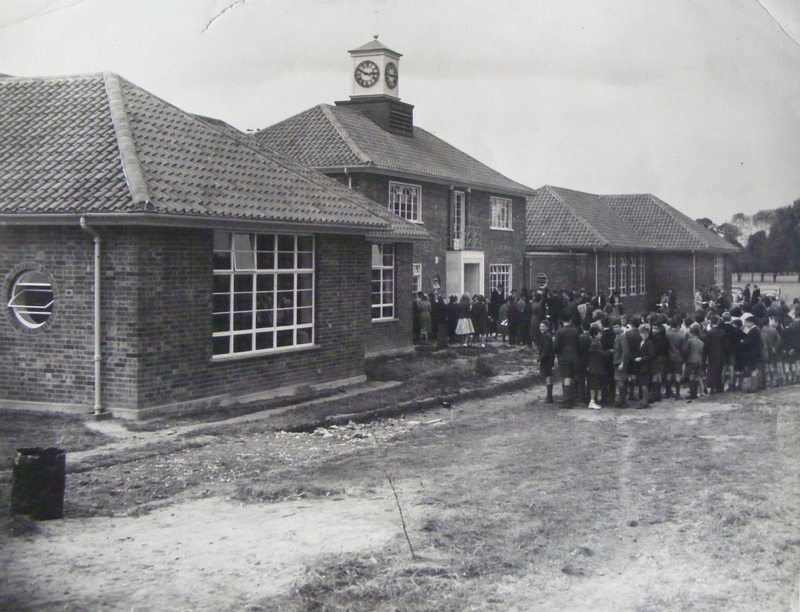 The school was planned to accommodate 320 pupils, and opened with 170 (up to nearly 300 by 1948), and initially had one Head and 4 staff (all women until 1946, due to war conditions). Under the 1944 Education Act, the school was designated as the Piggott C of E Secondary Modern School (often - incorrectly - called 'Wargrave Piggott'). Being at that time a rural area, agriculture was important, and so Rural Studies was part of the curriculum. This included animal rearing (pigs and chickens for example), and an orchard. The boys were taught crafts such as woodwork, metalwork and 'technical drawing', and this flourished under Maurice Willis, who joined the staff in 1946. Under his guidance, the boys built and ran a weather station in 1949 - officially recognised by the Met Office, and reported by BBC Television and Pathe Newsreel. This was followed by the building of a telescope for astronomical work. 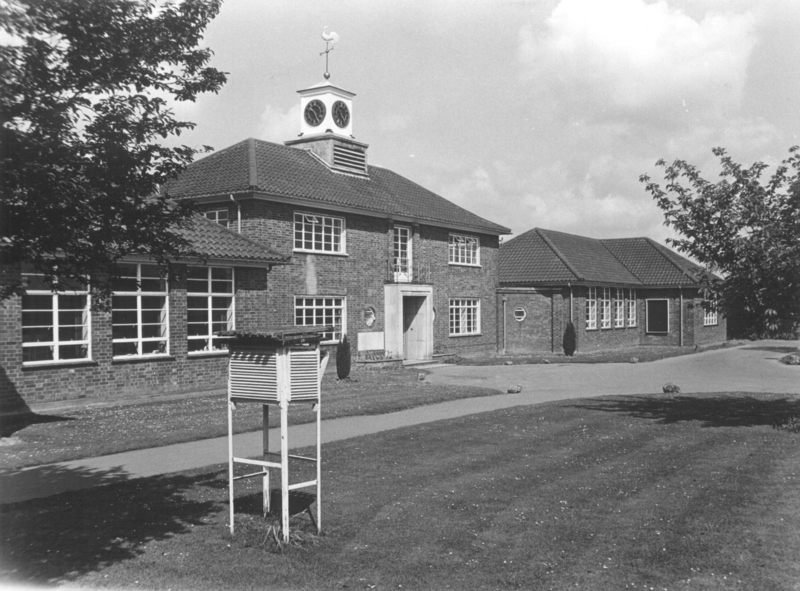 In the late 1950s a separate dining hall and kitchen was built, which, as pupil numbers increased, had also to be pressed into use as an additional classroom. (Pupil numbers had risen by this time to 560). An additional building followed in the early 1960s, including woodwork and metalwork rooms, whilst at the end of the decade, a 'ROSLA' building was built to cater for the raising of the school leaving age. A small sixth form was also begun at this time. The creation of new housing - especially in Wargrave and Twyford, at this time created a need for yet more teaching space, which was put up on what had been the school playing fields - the site being extended to both the north and south to create new sports pitches (the original site was approximately the middle third of the present one). The building programme was planned to also cater for the school being re-designated as a 'comprehensive'. The first two new buildings opened in September 1970, a two storey block having classrooms used (then) for teaching English on the lower floor, and specialist rooms for Home Economics above, with the administrative offices alongside, whilst the smaller building comprised two science laboratories and a 'prep room'. These were then followed by a pair of classrooms and practice rooms for music teaching, and then a further five laboratories, and a suite of maths classrooms as well as a Sports Hall was built. Finding enough classroom space was still a problem, with temporary classrooms in use at various times. In due course, a further building programme created a drama hall, and a set of classrooms for English teaching, and a new school library. The latter was opened formally by the author and broadcaster Edward Blishen in 1982. A school is not primarily about 'buildings', but about 'people' and ways to educate them, and Peter went on to talk about curriculum developments, and some of the extra-curricular activities that pupils - and staff - could take part in. A 'less than positive' piece of news for the school in 1983 was a plan by Berkshire County Council to reorganise secondary education in the Maidenhead area, including the closure of one of them. The Maidenhead area schools (Altwood, Cox Green, Desborough and Newlands) were all fairly close to each other, and putting the Piggott School in with this group seemed 'bizarre'. The communities that the Piggott School served were supportive of it, and in the end none of the schools was closed. At about this time Her Majesty's Inspectorate (as it then was) made one of its regular visits, and the resulting report in early 1984, and was much better news - "Piggott School praised as a 'caring community'' - with much sound achievement and some excellent features". The Piggott School is noted (then and now) for being a place where each pupil is 'known'. The school continues to expand its facilities, with a sixth form teaching block and ' a 'fitness suite' added in recent years, and is now a Church of England Academy. It has benefited from the stability given by several long serving teachers, and just 5 head teachers since 1940 - Clement Bush, Douglas Waghorn (from 1961), Keith Atton (from 1988), Hilary Winter, (from 2007) and now Derren Gray. The presentation ended with the showing of the film made by the school in 1949 about its weather station. (Recollections and history of the infant and junior schools had been the subject of talks in September 2004 by former head Ann Bushnell, and in October 2010 by former head David Poynter and Chris Wood respectively). The next meeting will be on Tuesday, June 12th, when Ian Wheeler, the author of a recent book on Fairmile Hospital, at Cholsey, will tell about the history of this Victorian Asylum, which provided for Berkshire patients with mental health issues from 1870 until 2003. This will be followed in July by the Society's visit to Dorney Court, and on Tuesday, September 11th Joe and Joy Haynes will recount the history of the Wargrave Theatre Workshop.